If you think you have heard the last on Nigerian history, especially the post-independence years, including, of course, the Biafra-Nigeria civil war, please, keep your gunpowder dry. The truth is that Nigerian history, to the extent there is such a thing, has been a product of lies-mongering and votes poaching politicians and not those of fact finding scholars and historians. And, somehow, these politicians, who sometimes come in the guise of armed coup makers and dictators have managed to convince or, perhaps, co-opt journalists into popularising these lies as truths. So, if one read Nigerian newspapers, all the hints he gets about the Biafra-Nigeria civil war are myths, fictions and unexplained and unexplainable absurdities passed off as truths. In a sense, it is all pitiable. The source of this error or pathology, we believe, is that most Nigerian scholars and journalists are not able to imagine scholarship and nationalism as independent and separate beings in and of themselves. So, in well-meaning, but definitely misdirected efforts to help prosper their nation, they pass off nationalisms for scholarship. Thus it is not uncommon to see a Nigerian professor of history tell lies that he thinks are patriotic and passes those off as truths. Sometimes, these lies are in the form of silences. So, for these professors, historians, public intellectuals and journalists, certain verifiable events may never really have happened. Their fear is that if the validities of certain historical facts are established, then the facts as so established are unpatriotic and would not aid nation building. And in a circular logic, anything that is non-patriotic is thus necessarily false and couldn’t have happened. Tragically for us, however, it is only truth that builds nation. Thus the first and fundamental act of nation building is in inquiring after the truth. The point is that falsehood cannot be patriotic. That is, however, divergent to the alleged purposes of a nation, the pursuit of truth is the only way to build nations. If you veered off the pursuit of truth, then you have left the path of national unity, prosperity and progress. To put it in more common language, the role of the leader, whether he or she is a politician, business person, religious mind, is to put into effect the visions of his superiors, the thinkers and scholars. The rap that the problem of Nigeria is leadership is ironically a product of our colonially jaundiced education. While the Europeans or the West will, for instance, join us in jamming leadership as the error inhibiting our development, in their respective countries, they blame the exhaustion of ruling paradigms or ideas, say capitalism or social welfare. To scholars of the West and their citizens, what goes wrong is systemic. This is especially so since leaders are changeable and have limited tenures. So, leadership which can be booted out and replaced can’t for 50 years and counting be a national headache, as it has for instance been for us. To Europeans, when the rot runs across generations, it is a case of systemic atrophy, not leadership dislocation. Now the only thing that can prompt the dead, the atrophied into life is the intellect, the invention of new organising order or paradigm. Not leaders. Leaders are artisanal beings and the earlier we understand this the better for this nation. Leaders are only as good as their instructions. Those who make these instructions and thus the attendant changes, are the thinkers and scholars. In other words, the ideas that rule a society are only made in our search for new truths and paradigms. And it is in the search of this new truth that we are happy to announce our new book: “How and Why the Yoruba Fought and Lost the Biafra-Nigeria Civil War’’. As Mother A’Endu says, it might as well be said of this book, that this history is new, this history is news. We are humbled to have a reviewer, an editor of a leading national daily state: ‘’Jimanze, bless you for letting the scales fall off completely from my eyes.’’ Now, if you want that aspect of Nigerian history as built on facts not fancy, as built as its own existent not to prop up country or lies, then it will be wonderful to have you as our guest in making history. We can’t thank enough all who made the official presentation of our latest book “How and Why the Yoruba Fought and Lost the Biafra-Nigeria Civil War’’ most memorable. Special mention must be made of The Sun team led by Eric Osagie, The Group Managing Director/Editor in Chief. And with him were his deputy, Steve Nwosu, and the Daily Editor, Onuoha Ukeh, amongst others. Special mention must also be made of Nze Bob Ihedioha, Okezi Ndubuisi, Ugo Muotto, Anslem Alloh, Chief Mike Ikwuagwu, the two reviewers, Charles Ike-Okoh, Kunle Abimbola and others too numerous to mention. Meanwhile How and Why the Yoruba Fought and Lost the Biafra-Nigeria Civil War is available at Patabah Bookshop Shoprite Surulere Lagos and The Booksellers, Jericho, Ibadan or the librarian, The Sun newspapers Lagos. Other locations coming. 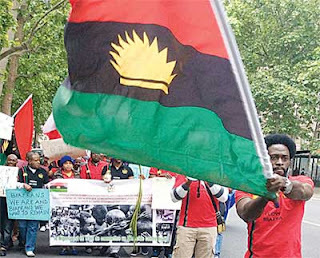 So whats the real Biafran Civil War story?